FlagMan.ie are Ireland’s number 1 online flag shop for world flags for sale. 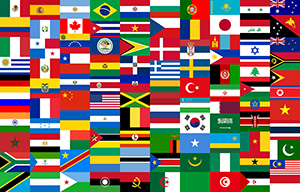 We have a large selection of world flags for sale so we are confident that you will find the world flag you are looking for. We have an extensive list of world flags ranging from Afghanistan, Albania, Algeria to Yemen and Zimbabwe. Our world flags for sale come in two sizes, 3ft X 2ft and 5ft X 3ft. The flags are screen printed onto 100% woven polyester which gives an extremely clear appearance with very bold and bright colours.We supply world flags to both domestic and wholesale markets in Ireland. Our flags are ideal for all occasions including to support your national team at sports games, pubs, community halls and at home. Not only do we have the best quality world flags online in Ireland but we also provide FREE shipping to anywhere in the Rep. of Ireland. And that’s not all. Our flags are guaranteed to be the best price available online so you are getting extreme value for money. You can simply browse through our large selection of world flags for sale by following the link below. If you cannot find what you are looking for simply drop us a call to +353 (0)857024810. Alternatively email info@flagman.ie and we will gladly help you find your world flag. In addition, you can view our world flags categories here.